Merrill Garbus treats every instrument, including her voice, like a treasure she eagerly excavated from a junkyard -- one man's drums, sax and ukulele are another woman's means to experiment. 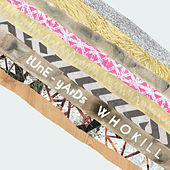 The core of tUnE-yArDs, Garbus is nearly impossible to pinpoint; her influences run from hip-hop to funk to R&B to free jazz to Nina Simone. One minute she's yelling out intriguing philosophies, the next she's sweetly chirping like a bird at sunrise, the next she's a "don't take sh*t from you" kind of woman. She articulates it all with a keen pop sense even as beats tumble, horns rumble and chaos erupts.